There are lot of brands providing great features under the 10K INR Range, Samsung doesn’t have many Smartphone under this price segment as last year they had launched Samsung Galaxy On7 and Galaxy J2. For this year Samsung released Samsung Galaxy J3 in Rs. 8990 INR. this Smartphone has specs like 5.0 inches Super AMOLED display, Spreadtrum SC9830 Quad-core processor, 8 and 5 MP camera, 8 GB ROM with support of 128 SD card, 1.5 GB RAM and 2600 mAh battery. Here we will have Short review, Pros and Cons of Samsung Galaxy J3. As we saw that lots of Smartphones are moving from plastic body to Metallic uni-body but Galaxy J3 still has plastic built with typical galaxy design and Aluminium ring running along the edges of the phone. As it is 5 inches phone with matte-plastic finishing that is compact enough can easily operated with a single hand. The volume rocker buttons are on the left, while the power button is on the right, bottom edge has a microUSB port. The back panel and battery is removable where SIM and Micro SD card slot is located. Most of the handset in this price range are providing 1080p (Full HD) display resolutions but here Samsung stick to 720p (HD) resolution although 5.0 Inches Super AMOLED display is quite sharp and vibrant with deeper contrast even after having only 294ppi of display density. This display has pretty wide viewing angle with good sunlight visibility. They have included 8 MP primary and 5 MP front camera, these camera are not the best for price but decent enough to capture good photographs in daylight. Rear camera has f/2.2 aperture size without PDAF and OIS so expecting a great photo quality from the handset is not fair although you may have some better pictures in sufficient lightening. 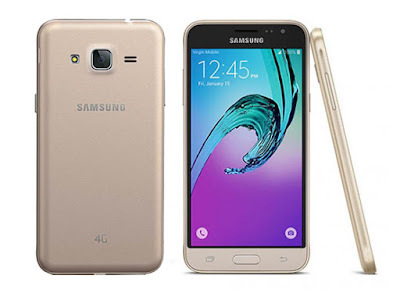 There are two variants in CPU of Galaxy J3 one has Qualcomm Snapdragon MSM8916 with 1.2 GHz clock speed while Indian version of J3 has Spreadtrum SC9830 Quad-core processor with 1.5 GHz of clock speed. This is first LTE 4G supporting SoC from the spreadtrum and doing good job for general day to day task but loading your device with lots of apps or heavy games definitely make your system slow. The Galaxy J3 comes with S bike mode that will help keep such calls at bay so that you can enjoy a tension free ride. However, if the call is urgent, the caller can press 1 on their phone and get through to you. 720p display and lesser power hungry CPU made its battery backup more longer, as phone has 2600 mAh battery which is quite sufficient to make it run for more than 1 day. It has pre-installed S-Bike mode for Safety. Dual-SIM support with dedicated SD card slot. Apps can be move to External SD card. Only 8 GB internal memory which is quite low. 1080p video recording not supported. Galaxy J3 is handset for the budget sensitive people as its current price in Indian market is ₹ 8990. It has crystal clear display, average camera, long battery backup everything is quite decent; although Definitely there are lots of Smartphone in same price group offering far better specs like Honor Holly 2 plus, Xiaomi Redmi Note 3 and Coolpad Note 3 but this is also true that Samsung has better brand value and After service. That's for sure. The operating system is Android 5.1, 1.2GHz frequency, etc. Uhans A101 have many characteristics better, and the price is much lower.